IEC will be at Hotel Azur in Siofók town, located at Lake Balaton, approximately 1.5 hours and 135 km (85 miles) driving distance from Budapest and the airport. The quickest way to get to Hungary is by air, and there is only one airport. 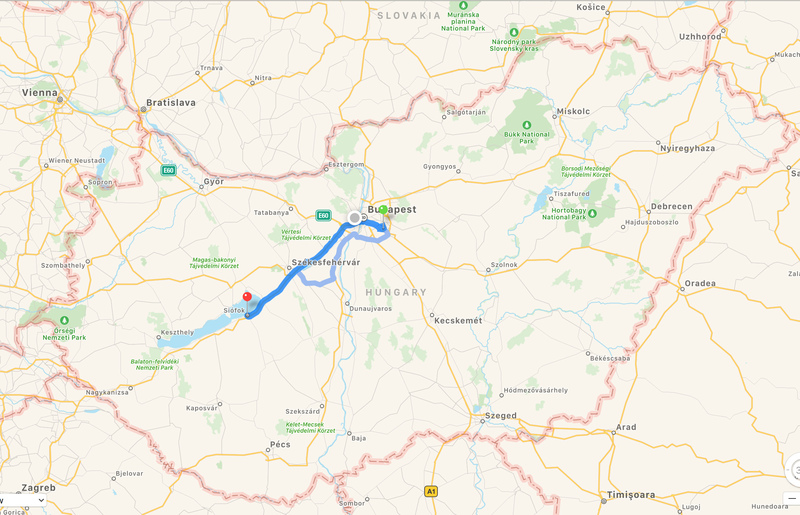 It is just outside of Budapest (green marker), and it has a direct highway connection with Siófok (red marker), so it is a smooth and easy drive to Hotel Azur. The best way, therefore, to get to IEC is to take a shuttle van. You can also take public transportation (train or bus), but there is no direct connection. It will take twice the time and you will need to change route 3 or 4 times, finishing with a 1.5 km walk. If you can afford €50 for a 135 km long, 90 min direct highway drive, take the IEC shuttle to have an easy and smooth arrival. We have contracted a shuttle company who offers IEC shuttles for half the price of the regular airport shuttles, and with the same service (Mercedes vans). IEC shuttle: €50, get-yourself Airport Shuttle: €100-120. Taxi: € 120-200. See details below! You can also take a train from other European countries, or drive, but while a flight will be 1.5 hrs, by train or automobile would take 12 hours. The Ferenc Liszt International Airport (BUD) is located approximately 25 km from Budapest city center, and 135 km from Siófok, the IEC venue. Cheap flights are available to Budapest from almost every European country. Flights from outside Europe will often transfer at a major airport, such as London Heathrow or Frankfurt, Germany. A flight from Frankfurt typically takes 90 minutes, and one from London or Moscow 2 hours. International flights arrive at Terminal 2. Taxis and airport shuttles are easily available and are reputable, but run at higher prices than the same-value IEC-organized shuttle. AVOID money exchange at the airport; they have a tourist ripoff rate. You can withdraw cash (Forints, the local currency) at ATMs at the airport and in many places. The cash exchange rate is much better in the city. Hotel exchange rates are okay, but higher than in the city. You can pay with debit and credit cards in most places (hotels, restaurants, supermarkets). You can’t use Euros or dollars to pay in cash. IEC shuttles transfer you directly from Budapest airport to the Azur Hotel and back during the following timeslots for €50, which is half the price of taxis and regular shuttles. At other times you will need to arrange your own airport shuttle or taxi cab (you can ask for assistance at the hotel reception). After you have signed up, we will contact you and confirm your seat. Payment will be handled in cash in Siófok — you can pay in Euros or Forints.